During an diplomatic visit to Japan on Tuesday, Mr Hunt made a snide remark against his predecessor for continuously berating Mrs May’s handling over Brexit negotiations, insisting he and will soon be “proved wrong”. 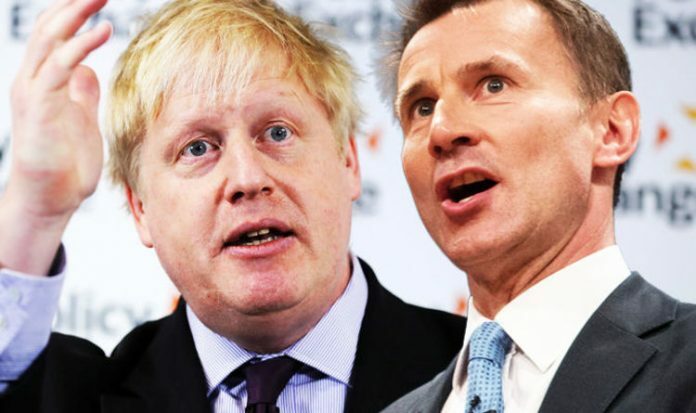 Mr Hunt told Japanese officials: “British politics is littered with the graveyards of people who have predicted the demise of Theresa May and been proved wrong. The Foreign Secretary became the first British minister to openly deliver a speech in Japanese. During his Japan visit, Mr Hunt met with Japanese Prime Minister Shinzo Abe and foreign minister Taro Kono to discuss the future UK-Japan economic partnership and security on the Korean Peninsula. Mr Hunt revealed he was “cautiously optimistic” the UK will strike a Brexit deal before leaving the EU. He said: “I don’t think it’s brinkmanship. If we can’t come to an agreement, then the default is that we will leave the EU on the 29th of March. Mr Hunt spent 18 months in Japan during his twenties, and spoke about his love for Japanese people and culture. Addressing the need North Korea sanctions, the Foreign Secretary added: “I think the lesson of the last few years is that the pressure works. The sanctions are very important. Mr Hunt became Foreign Secretary in July after Mr Johnson sensationally resigned from cabinet in protest over Mrs May’s Chequers deal.